When we were on holiday in France this Summer, I bought a gorgeous, vintage smock dress for Mila. 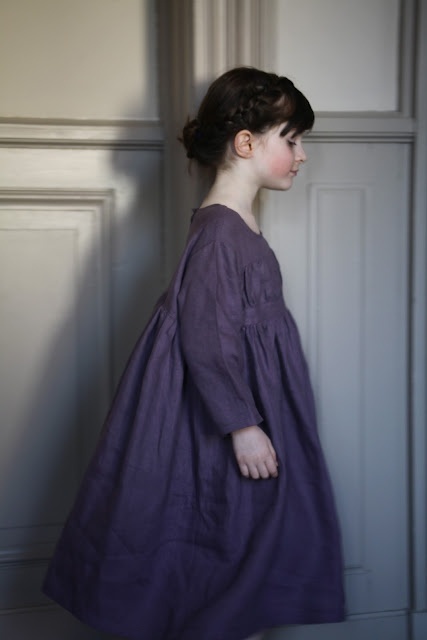 It reminded me the kind of dresses we were wearing when Elodie and I were little. Ok not quite the look I was aiming for but she went ahead with it. This gives me the chance to introduce you La Princesse Au Petit Pois, a beautiful, poetic collection of clothes for children designed by the talended Alexandra Darcissac. All the clothes are made in France and are simply beautiful. My favourite pieces are this gorgeous Notre Coeur dress and the Ilo blouse and the bloomers are just adorable! Oh lala ! !Quelle jolie surprise ! Tu vas enchanter ma journée, merci! Elle le mérite,cette marque est somptueuse !!! beautiful and creative photos! Congratulations!